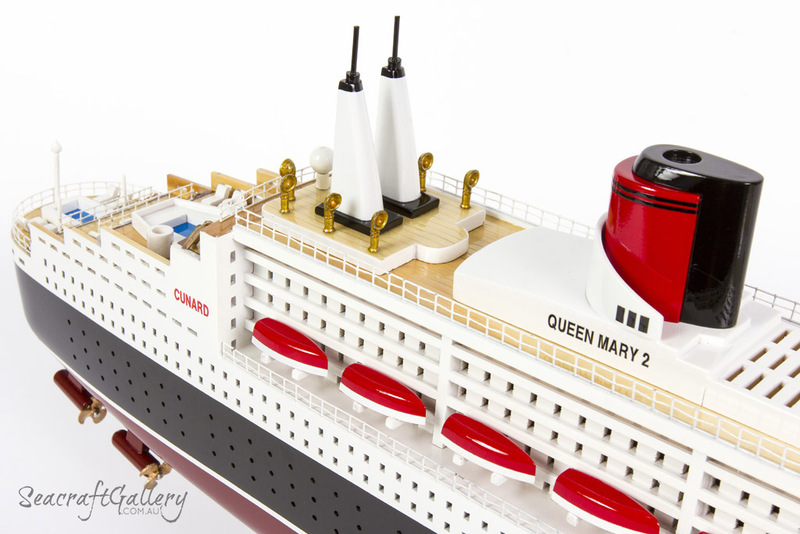 As a remarkable flagship of the Cunard Line, the Queen Mary 2 is a fine example of modern nautical prowess. At the time of her construction in 2002, the ship held the distinctions of being the longest and largest of cruise ship ever built. 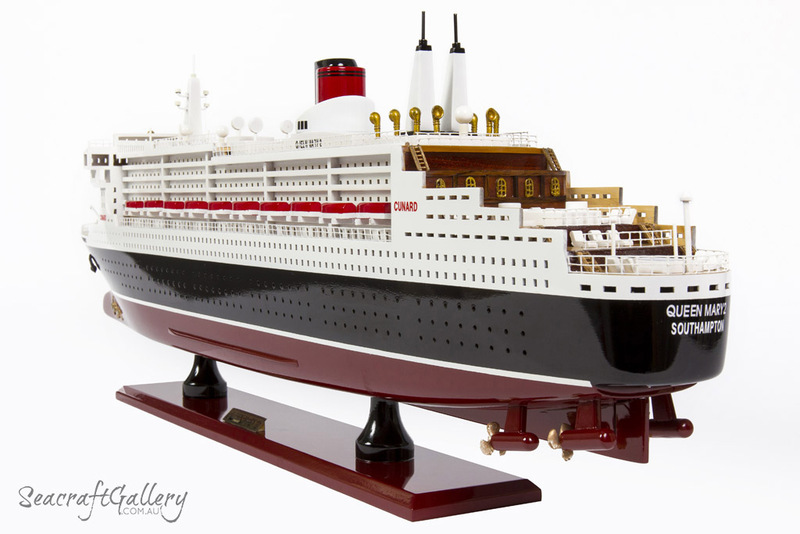 Named after Queen Elizabeth II, it takes the lineage of the original RMS Queen Mary, of 1936. It’s also the only ocean liner in service that goes between Southampton, England and New York City, USA. That makes it a pretty special ship, not to mention the fact it’s fitted with some of the most modern, enterprising features found in modern ocean liners. 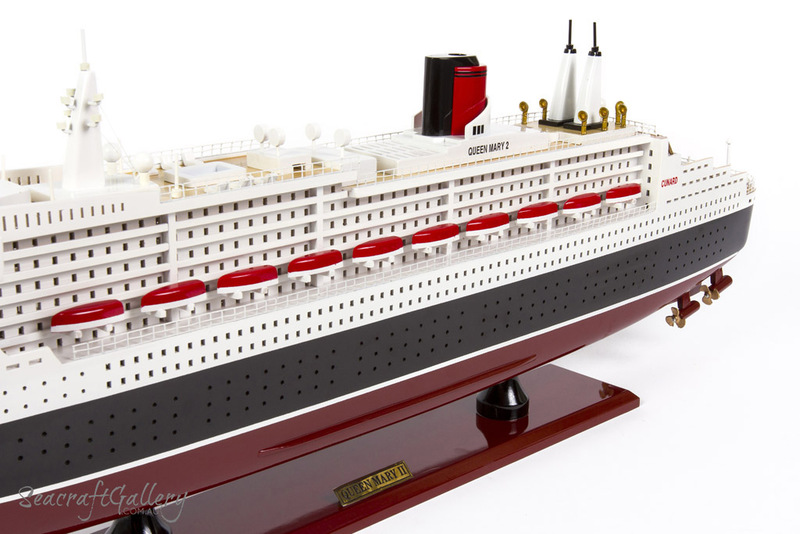 For many, it’s the perfect example of 21st century quality ocean liners. 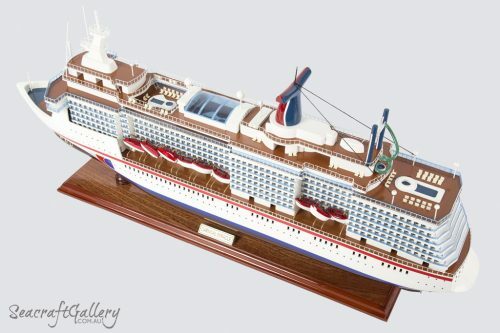 This cruise ship model looks to capture this ship in its 2004 vintage. 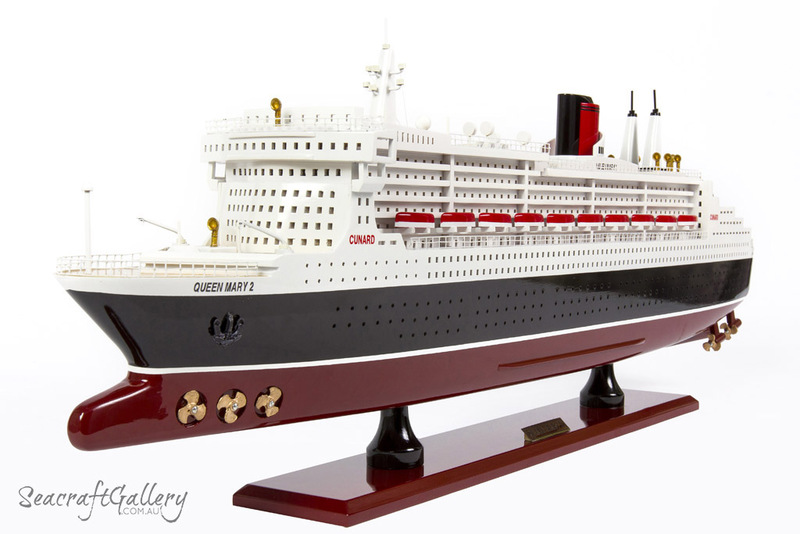 For a Queen Mary 2 ship model that accurately portrays its elegance, eloquence and detail all at once, then, be sure to take a look at our new Queen Mary II model. It’s a record-breaking ship in many ways, and would make a fine finishing touch to any business looking for an added touch of opulence in the boardroom. 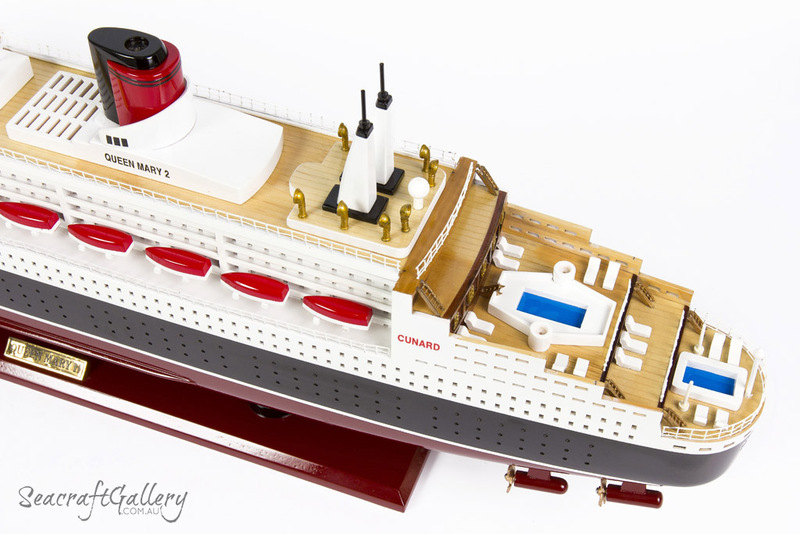 Delightfully detailed, 1:430 scale Queen Mary 2 model ship. 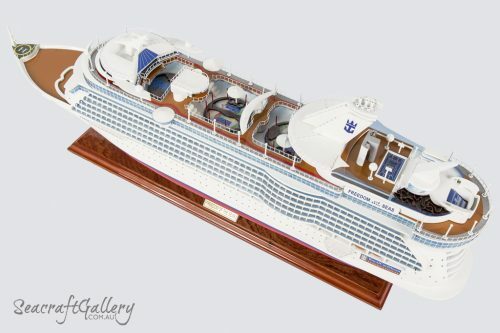 Fully assembled cruise model ship – this is NOT a kit, but ready for display. 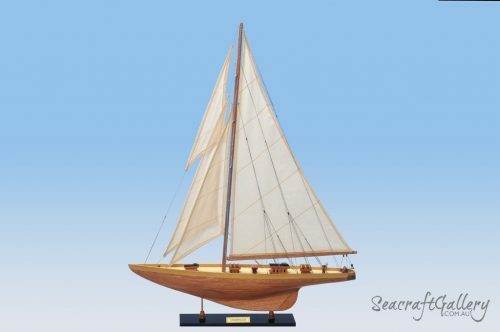 Made by hand using wooden planks on the decks, hull and features included. Delicate add-ons like metal railings and propellers made from metal. Windows and portholes are cut into the hull of the ship, not stuck on or added. 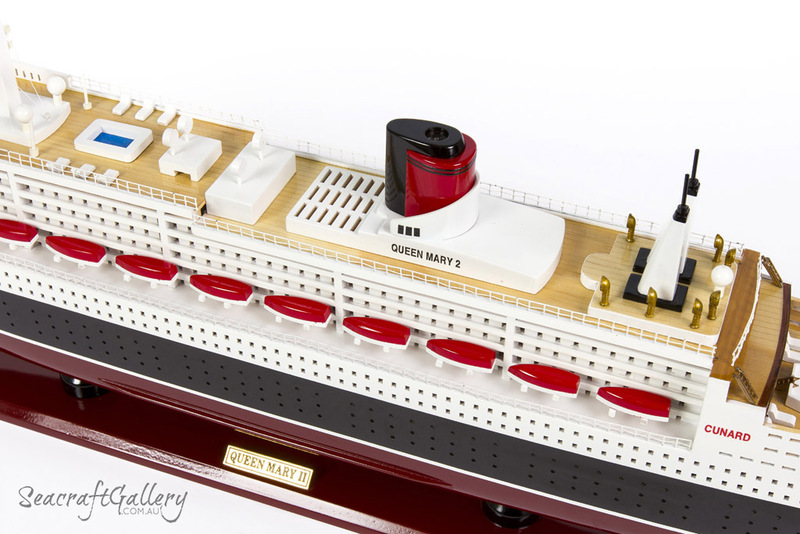 Other features such as lifeboats and deck details made from wood, not plastic. Busy deck with items like deck chairs and pool slides are accurate to the ship. Wood detail used to help ensure that the wood is protected from long-term climate change. Paint scheme to match up with the real ship in every way, shape and form. Comes with a strong wooden base and brass nameplate for display purposes. Suitable for display in a display case of your choosing. 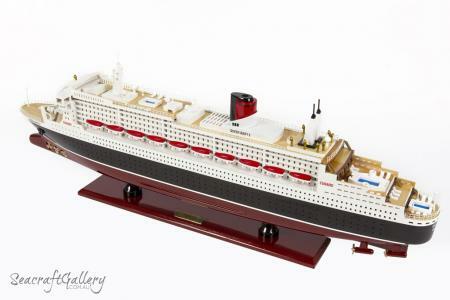 The Queen Mary 2 model cruise is also available in 80cm. 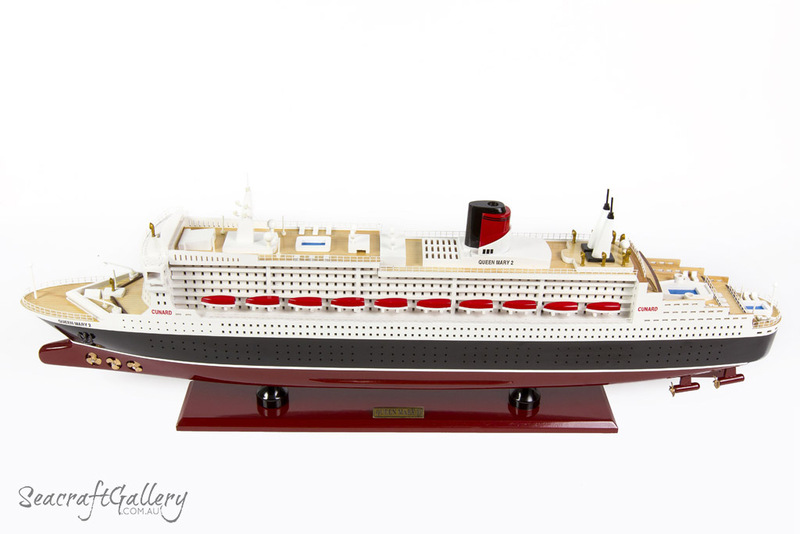 The RMS Queen Mary II is a Cunard Line ocean liner, and is named after the Queen of the Mary, a famous RMS ship from the 1930s. This new ship is the flagship of the Cunard Line, having taken over from the Queen Elizabeth 2 in 2004, a year after its construction. First ordered in November 2000, it came to be at a cost of £460m, it was designed by Stephen Payne and built by French experts STX Europe Chantiers de l’Atlantique. From 2004-2011, it was based in Southampton, England. However, since 2011, it has resided in Hamilton, Bermuda. The Queen Mary II set about its maiden voyage on the 12th January, 2004, around a month after its completion. 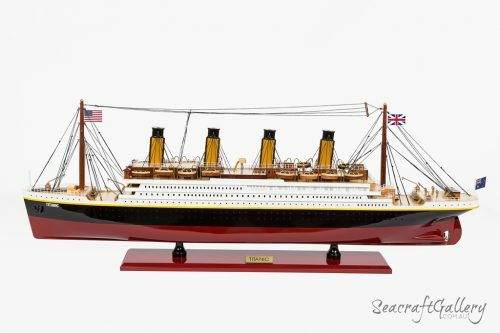 Interestingly, the ship was designed primarily for crossings to the Atlantic, as it often carries out trips to both New York and further afield during its world tour. This meant that it required a more unique development, with an extremely high standard of materials meaning that the ship cost as much as $300,000USD per berth. 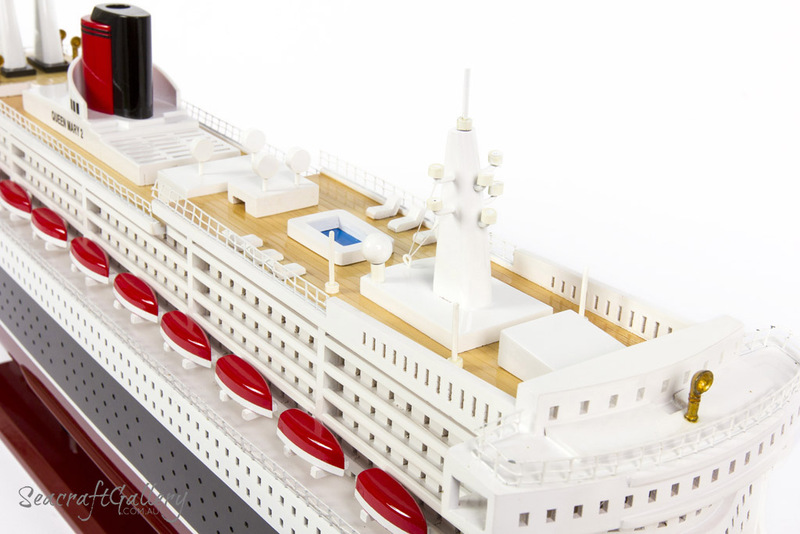 With 40% more steel than the average cruise ship, too, this was designed with the intent of being a world-class ocean liner. The maximum speed that the ship can do, though, is very impressive for something so large. Capable of hitting a maximum speed of 35mph and a cruising speed of 30mph, it can move through the waters at paces far more impressive than the average cruise ship. Thanks to an integrated electric propulsion system, the Queen Mary II can move at these speeds. The ship once held the distinction of being the largest passenger ship in the world, overtaken by the Freedom of the Seas eventually. 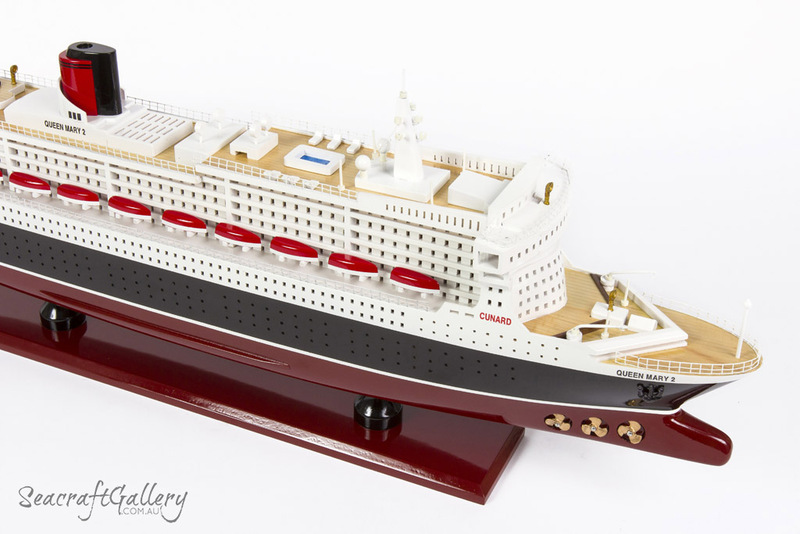 However, it does remain the largest ocean liner ever to be built – with a displacement tonnage of 76,000, it’s also a world leader for this kind of ship. Aboard the ship itself, lucky visitors will be able to enjoy a truly tremendous fifteen restaurants and bars, as well as five swimming pools, a casino venue as well as a ballroom and theatre. It’s also got a planetarium – the first to be built for use at sea. The ship has enjoyed many uses over the years, and is primarily a part of many royal celebrations and events. It has been used for various world cruises, too, often attracting many viewers to see this incredible craft in action. Indeed, it carried out a first ever circumnavigation of Australia, then to Japan and then back to Southampton in England through the southern coastlines of Eurasia and into the Suez Canal. Among its most impressive meetings are the Cunard Royal Rendezvous events which take place, when the Queen Mary II will meet up with the Queen Victoria and the Queen Elizabeth for rendezvous events, often in New York. They played a role in the celebrations of the Diamond Jubilee for the Queen of England in 2012, too. This included the 2015 175th anniversary of the Cunard line, starting in Liverpool and working their way through various parts of the country. They even followed the route of the original ship, the Britannia, heading to Halifax, Nova Scotia. It moved from there to Boston, to New York. The Queen Mary II underwent a refitting in 2016, upgrading much of its systems for a cost of £90m. this was carried out including the addition of fifteen new staterooms, some new balcony staterooms and also some impressive new animal kennels. Well packaged, very quick delivery, great model.